Visit our "Frequently Asked Questions" page for quick answers to common questions. We spend the much of our time working in our gardens and are not always able to answer. If you do not get a person, please leave a message and we'll get back to you as soon as possible. If you have a problem with an order, using our support system above will generate the fastest results. 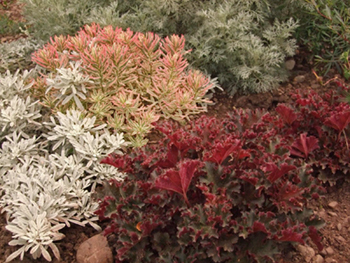 Our online business specializes in high-end designer perennials that command a premium at nurseries and garden centers. We ship smaller, and much less expensive plants known as commercial grower plugs. Below are some plugs that we planted directly into our gardens this spring. This picture was taken in late August, just three months after the plugs were planted.